Danville Middle School Head Athletic Coordinator and Football Coach Mike Broaddus made a play that would touch the heart of every fan in the stands at the last home game on October 10. Danville Middle School Head Athletic Coordinator and Football Coach Mike Broaddus made a play that would touch the heart of every fan in the stands at the last home game on October 10. He geared up his athletic managers Gage Dunivan, a 7th grade student with cerebral palsy, and Michael Driskell, an 8th grade student with disabilities, to make the first play for Danville to score a touchdown against Spring Branch Middle. 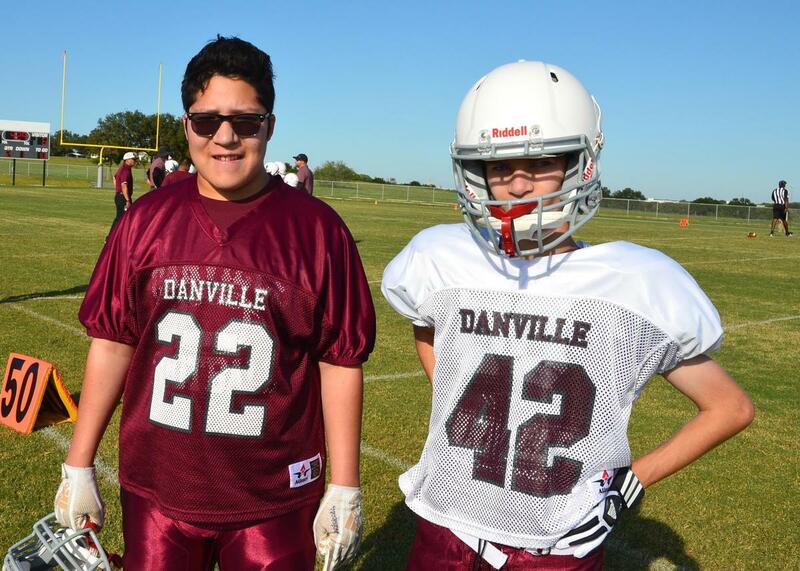 Broaddus has a student athletic manager for his 7th and 8th grade football teams, both with special needs, and according to Dunivan and Driskell’s moms, these roles have made all the difference for their sons. Dunivan continued to explain how Broaddus has made a positive impact on her son. Dunivan also emphasized other skills Broaddus has been teaching his students outside of just football; responsibility, respect, courtesy and confidence. Coach Broaddus is a Canyon High School alumni and has been coaching for Comal ISD for nine years. Coach Broaddus continued by thanking those who helped make this game so special.